The Nintendo Switch instantly became my favorite place to play indie games, simply for one key reason: it’s a hybrid console. There are plenty of times I want to plop down in front of a big screen, enjoy AAA graphics, or take things really seriously with complete focus and my Pro Controller in hand. But platformers, puzzle games, and story-driven experiences are games I love to curl up with whether I’m lounging in bed, looking for a quick getaway during my commute, or sinking into a Papasan chair (if you’re not familiar with these chairs, get one. They are absolutely worth the price). So I’m constantly jumping onto the Nintendo eShop and keeping my ear to the ground when it comes to fun (and preferably cheap) indie games on Switch. 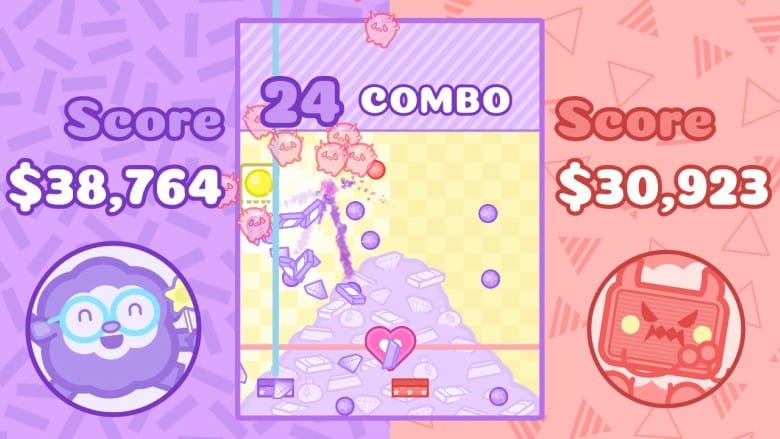 I was able to fall in love with one of the cutest, oddest, and most aggressive modern arcade experiences on the platform thanks to a Nintendo Switch Hidden Gems video by Metal Jesus Rocks: #BreakforcistBattle, a game developed by Lucid Sheep Games with art and music by Pete Ellison. Starting a game title with a hashtag may be convenient for social media marketing, but it’s a mouthful to say. It’s a name that leaves you with more questions than answers. What the hell does Breakforcist even mean? But the strangeness of it all is the perfect introduction to this brick-breaking breakfast themed game. 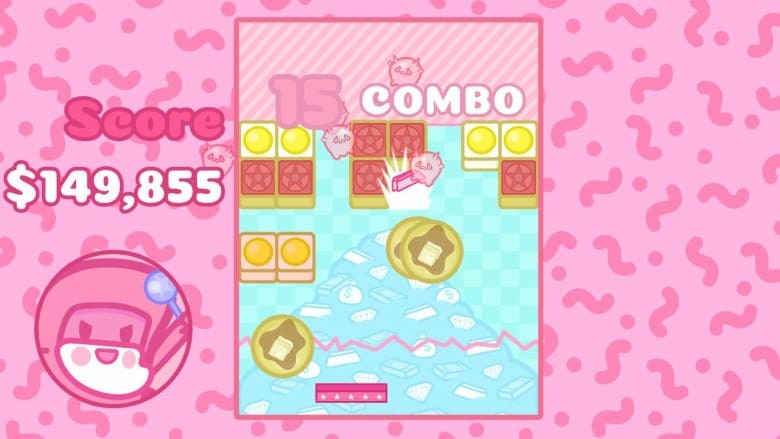 #Breakforcist was originally released on mobile platforms in March 2017 and appeared on the Nintendo Switch eShop as #BreakforcistBattle on April 12, 2018. This new name came with both cooperative (1-2 players) and competitive play (2-4 players) added to the game. While the story doesn’t really come into play, there’s still a tale behind the quirkiness. 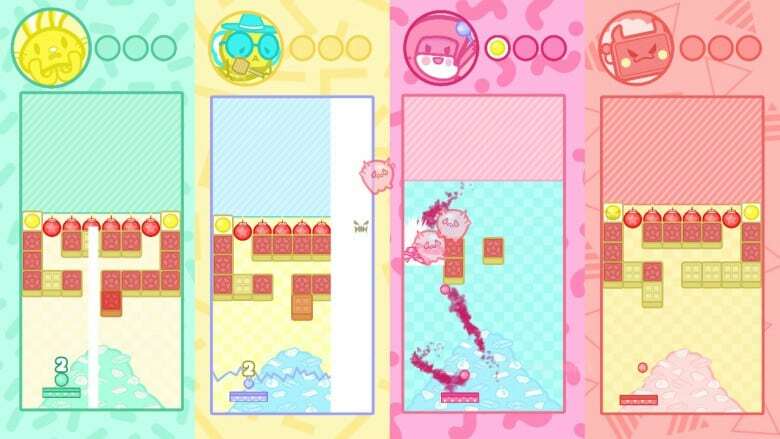 The team describes #BreakforcistBattle as a “breakfast/exorcism-themed waffle-busting game” in which players “use [the] magic paddle and ball to rescue breakfast with classic brick-breaking gameplay.” Essentially, you’re saving breakfast from the clutches of evil. I honestly can’t imagine a more urgent, worthwhile mission. Gameplay-wise, think Breakout but with waffles and wacky power-ups including but not limited to big pancakes, bacon lasers, fireballs, and more. 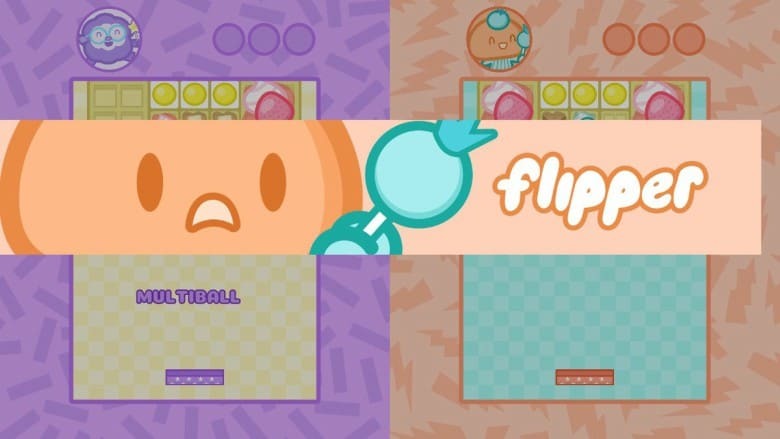 The gameplay loop is easy for anyone to pick up: your goal is to hit the waffles, eggs, and bombs that are lined up at the top of the screen with the ball. Slowly, these breakfasty blocks will move towards you. If they reach the bottom of the screen it’s game over. As long as the mechanics are functioning properly games that are replicating classic arcade games tend to be automatically pretty solid. But #BreakforcistBattle goes beyond its inherent “clone” status because of its charm and, more importantly, its chaos. In addition to making some adorable art featuring 8 distinct characters and plenty of pink and pastel, Pete Ellison also made a banging soundtrack spanning 21 EDM songs for a total of 42 minutes. Each track is bubbly and upbeat. It’s an explosion of fun, frenzied synth that’s as outlandish and joyful as the game itself. Limited edition vinyl available via The Yetee. While predominately instrumental, the soundtrack features some robotic vocals on the tracks featuring Cyber Diva. Best of all each track is incorporates breakfast foods into the title. Breakforcism’s eerie tone makes me feels like I’m at a Halloween dance party. Breakfast Trap creates a consistent groove with its hip-hop style and generous record scratches. Lastly, WAFFLE♡LOVE feat. Cyber Diva encapsulates all my feelings for waffles and is also pretty double entendre friendly. But seriously, who doesn’t love waffles? The #Breakforcistbattle soundtrack is available on Spotify and Bandcamp. 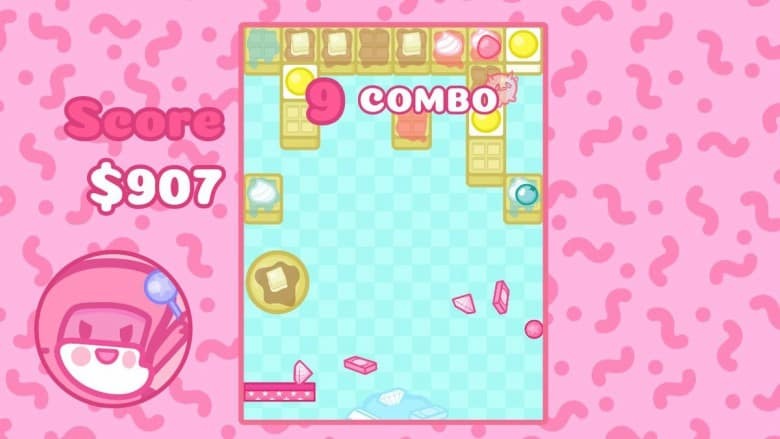 The power-ups extend gameplay by helping the player clear breakfast blocks more quickly. Fireballs that cut through blocks (rather than immediately bouncing off of them) and lasers that shoot through entire vertical sections provides quick ways to make a comeback. Those on the right side of history know breakfast is the best meal. So I can’t help but smile as giant pancakes power-ups are floating across the screen as I rid the plate of evil. Your field of play is vertical so it’s easy to clear plenty of breakfast bricks even if you’re bad at strategizing with intentional paddle positions and angles. More advanced players will want to take advantage of hitting certain blocks at optimal times. 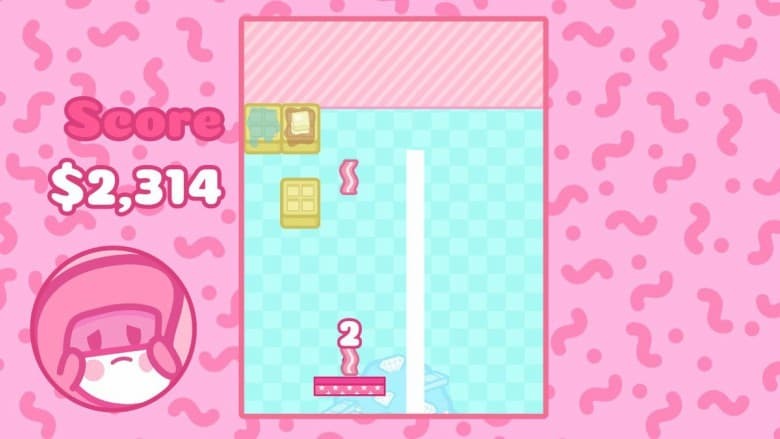 For instance, hitting a bomb will push all the blocks back which gives you some extra breathing room. As a Breakforcist, be ready for some evil faces to appear on the waffles but stay the course. And remember, you don’t have to go it alone. 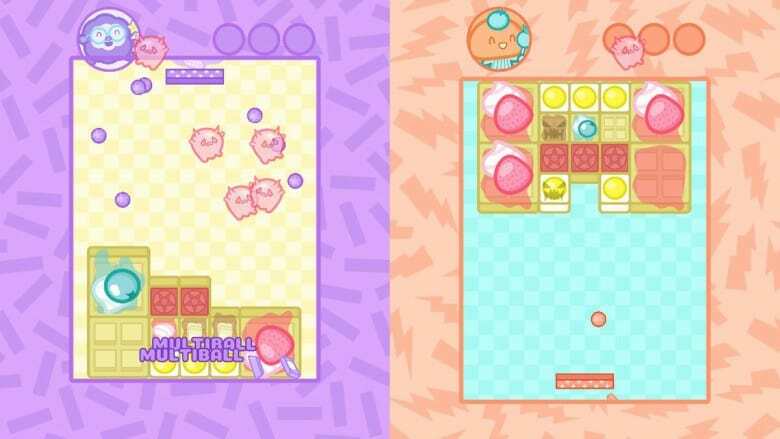 In co-op mode, two paddles will appear for each player. The challenge stays the same so you and your friend should be able to make it even further when playing together. Competitively, there’s plenty of random occurrences to keep all players entertained. You can face off against up to 3 other friends in Battle Mode. Each of you has your own play area similar to the versus modes on games such as Tetris. Here the goal is to be the first to clear your board. You can set it to a single match, best of 3, or best of 5. For added fun some of the power-ups in this mode mess with your opponents. You can add waffles to their boards to flip the entire thing upside down and invert their controls. The mix of luck and skills keeps things exciting for skilled players while leveling out the playing field for those who aren’t as accurate with their paddles. Much like breakfast #BreakforcistBattle is good any time and all the time. This is a must own little indie gem on Switch and great for some quick pick-up and play sessions. It’s available on the eShop right now for $9.99.